Here's a lovely salad that you can whip up quickly while you are preparing the rest of your meal. It is light and crisp and goes well with chicken or fish. I came up with the idea when I was looking for a way to use the rest of a batch of balsamic vinaigrette I had whipped up for a salad. I had half of a Napa cabbage in the crisper and that inspired me to create something with Asian flavors. From there it was a simple step to add the snow peas and cucumber to the mix. Celery would also make an excellent addition. 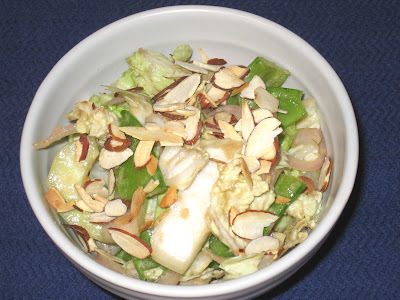 The toasted almonds provide a visual and textural contrast that makes the salad both appealing and delicious. Place the sliced shallot in a small bowl and cover with the rice wine vinegar. Set it aside and let the shallots soak in the vinegar while you prepare the rest of the ingredients. Combine the cabbage, cucumber and snow peas in a large bowl. Drain the shallots and add them to the bowl, along with the ginger. Combine the vinaigrette and the soy sauce and pour it over the salad. Sprinkle the toasted sesame oil over the top and toss to mix well. Serve garnished with the toasted almonds or sesame seeds.